Scented flowers, which are so dark they almost look black, appear throughout the summer and gradually become a little paler, but still maintain a deep burgundy hue. The lower lip of the flower is a more distinct shade of purple, and these create a great contrast. Their bold colouring teams up well with lush purples and plums. In our (not very scientific) sweet pea trial on the nursery, we found that the flowers of this variety had a slight scent and were held on 6" stems. There were not too many left in August though. 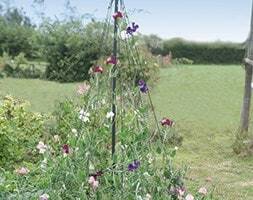 All the sweet-peas in our trial produced significantly better plants when the seeds were sown in autumn rather than spring.